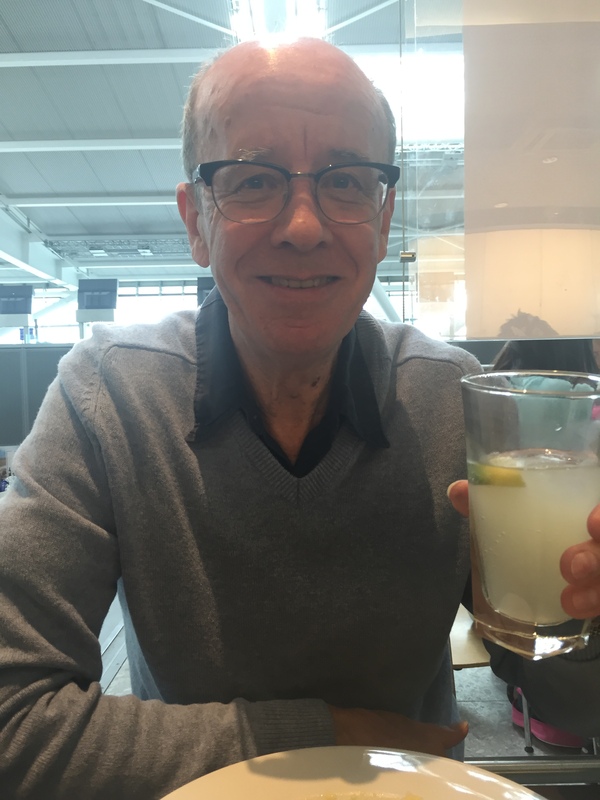 Day 1 – Heathrow to Atlanta! So, Day 1 of our 2016 adventure begins! We awoke to grey overcast skies in the UK but my weather app was telling me that when we arrived in Atlanta it should be 82º …………… I think we can cope with that! The car arrived on time to take us to Heathrow and turned out to be the same guy who drove us last year! We arrived at Heathrow T5 in plenty of time which was lucky really as earlier in the day the M3 had been completely closed! Unlike Virgin Airlines where you can drop your bags off at anytime, with British Airways (yes, flying with BA this time) it’s timed so we couldn’t off-load the bags until 1.00 p.m. and decided a spot of lunch was in order while we waited! 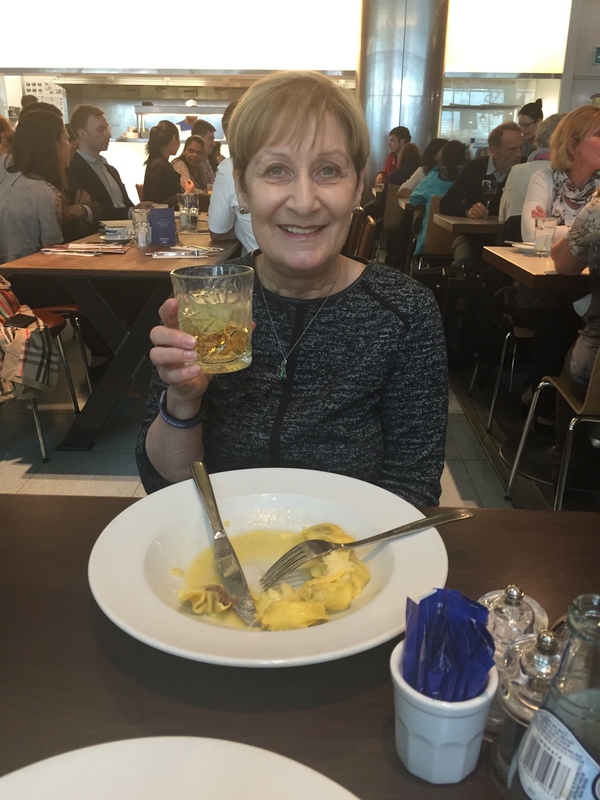 We ate in Carluccio’s and very nice it was too. 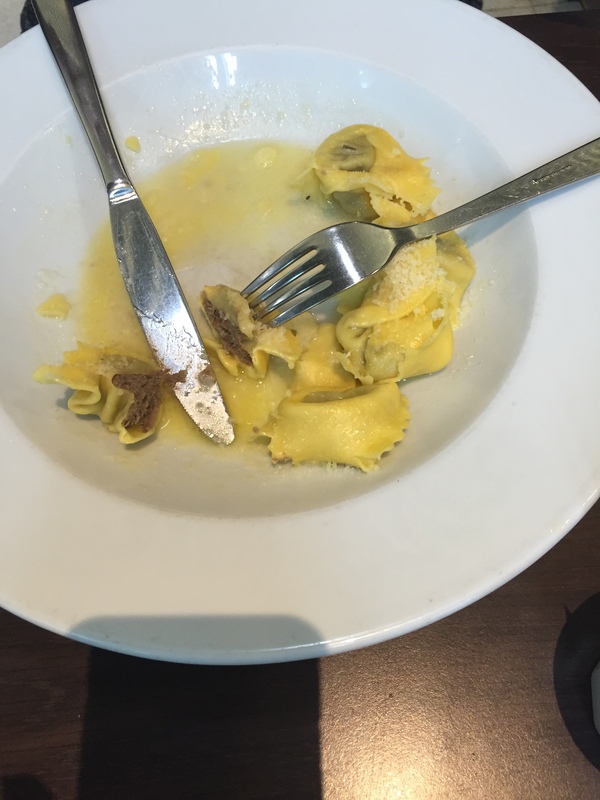 We both had Venison Tortelloni, yes that’s what is was, not tortellini, (handmade fresh tortelloni filled with wine braised venison), it was delicious. Simon had a soft drink, Limonata, (he’s driving later) and I had a Gin Giardino (gin, elderflower, Prosecco and fresh apple juice served with a slice of cucumber) and very lovely it was too! Here’s the first of the food photos!!! Well, it wouldn’t be the blog without a few food photos! I must confess to having two cream teas yesterday! One in the airport lounge and another on the plane. Well, it seemed rude not to! Had to make the usual Duty Free run for perfume (a girl can never have too much perfume!) and on to the lounge to sit and relax until our flight was called. I think we must have done well over our 10,000 steps (that’s good as we missed our spinning class!) as the aircraft was about 10 miles across the airport (well, not really but it sure felt that way the amount of time it took us to reach it). It was a good flight and although we were told it would be 9 hrs 10 minutes it actually turned out to be only 8 hours so that was a bonus. Once the bags were collected (only two I might add and well under our allowance!) we got on a bus to take us to the car rental facility. ‘Hold on to your hats’ comes to mind here! We had a very pleasant lady bus driver who obviously liked her speed! We were taking 15 mph bends at 50 mph! It would have been funny if it wasn’t quite so scary. We were holding on for dear life. There was a young lady with us on the bus and she said she was going to report the driver as she was positively dangerous. We decided on an upgrade when we get to Avis, they did us a very good deal on a Ford Escape, that’s an SUV to those in the know! 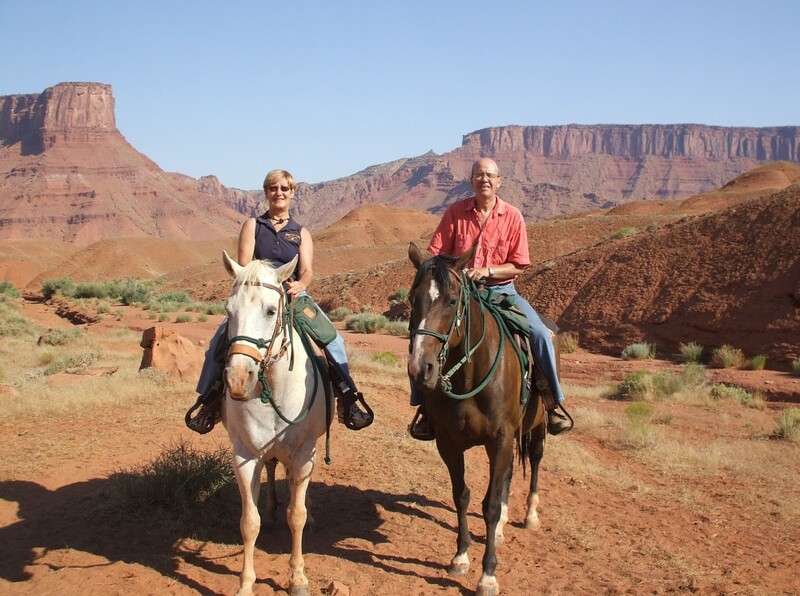 For our regular blog readers, you will remember that was the vehicle we had about three versions of on our ‘big trip’ back in 2013. Photo will follow at some point. So, here we are at our hotel. We arrived at 10.30 p.m. local time so that was 3.30 a.m. to us and we were worn out. Still, we’ve had a sleep of sorts and it’s now 5.09 a.m. and hence I think it 10.09 a.m. so decided to catch up on the blogging. Sounds like an amazing start to another great trip. Hi Nat, If you see two old geezers looking puzzled that will be us trying to understand what an rbi is. Thanks Sue, jeez it’s hot here! Thanks Ann, it’s hot here!